Looking To Sell Your House Fast in Mustang? We are a locally owned, BBB Accredited company that BUYS houses in Mustang. We aren’t your normal, picky home buyers looking for our dream home who take 45-60 days to close on a house purchase and ask for lots of repairs and for you to pay $5,000 in closing costs…. Ready To Sell Your Home in Mustang, OK And Need It To Happen Fast? A lot of homeowners trying to sell a house in Mustang, OK opt for the traditional process; finding the right agent, appraisals, making updates and repairs, listing the home, showing it, waiting for offers, etc. Unfortunately, the process is rarely quick. There’s a much better approach to selling your house fast. W Properties provides homeowners with a hassle-free, no-cost approach to selling a home. As an A+ BBB accredited investment company, we regularly purchase homes for cash as-is. This streamlined approach eliminates all the waiting and can get you cash for you house in under 30 days. In fact, we often close on homes and pay the seller in as little as 14 days! How Long Does It Take to Sell a House in Mustang, OK? While housing markets vary and tend to fluctuate from year to year – even seasonally – it’s always a risk putting a house up in a traditional listing if you need it to sell fast. Even when the home market is in the favor of the seller in Mustang, there’s the potential that it could be months before the right buyer finds your listing. Or that they never find it at all. On average, selling a home traditionally can take anywhere from 60 to 90 days before you get offers. Depending on the buyer and the state of their financing, closing could take just as long. Imagine having to add weeks on to that if you had to make even basic cosmetic updates to your home. That’s not a recipe for selling your home fast. 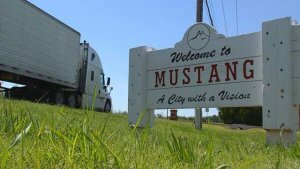 Hassles and delays like that are why more homeowners around Mustang have sold their homes to W Properties. Imagine the frustration of going through months of waiting only to have the offer you were ready to accept back out on you. Even when you accept an offer from a buyer there’s no guarantee they will close. A great real estate agent can certainly help build visibility for your listing, but they have no control over generating offers and ensuring your home sells. That’s why more homeowners are choosing to sell to W Properties. You don’t have to worry about locating buyers, getting offers, and showing your home because we’re the buyer. We’ve taken a months-long process and streamlined to just weeks where you sell your home fast for cash – all without the headaches that come with selling your home traditionally. Most importantly, we buy homes in Mustang, OK as-is. Whether the home came from probate, needs costly renovations, has fire or storm damage, or you just want to offload it as quickly as possible you’ll get a fair cash offer with a rapid turnaround. Virtually every home needs at least cosmetic updates before it can be listed. Can you pay $1500 or more for updates and repairs? While you wait for your home to sell can you carry the mortgage, insurance, upkeep and other costs for an indefinite period? What if it takes 6 to 8 months before you get an offer? What if your listing never sells? If you have property to sell in Mustang, OK and need to move it fast then call or text us today at (405) 673-4901 OR fill out the form below. We’ll connect with you right away and get you a cash offer quickly.